Sofie's World – Living life as if getting out of the box! Zamboanga is also known as the City of Flowers when the Malay settled at the tip of Zamboanga peninsula and saw a group of ornamental plants that beautifully bloom in the area and called it as “Jambangan”- land of flowers. Other version was the “saguan/sambuan” also from Malay word means paddle or pole which was used by the locals to paddle their colorful Vintas. Security 101 – Let us be fair in all the cities and provinces across the country. Zamboanga is a huge if not big peninsula and ticking part of Tawi-tawi and drag it to the downtown gives an image of negativity for tourist. Every place has this so called “no to go” zones, perhaps the “no to go” zones of Zamboanga has been in the limelight of media and spreads the news up north. While it is true that you can see army and police visibly around every corner, but honestly,you will feel more secured, and I bet Zamboanga is relatively much safe than some corners of metro at night! Also, Zambonaga is an open city, like any pother other city here up north, the difference perhaps is the factor of insurgency and terrorism, no more no less. A City where Muslims and Christians lives in harmony – this one is debunking # 1 stereotype in my head. I must say that not every corner has this so called “Islamic influence” but of an amalgamation of both Christian and Muslim cultures. So interesting isn’t?! Up North in the urban Manila, we always think that Mindanao is a place of insurgency and politico-socio- cultural conflicts, but I say nay. People live here in harmony, you would be amazed how two different cultures interacts with one another with no weapons, no hate and etc. – so amazing! Know when to Harvest or forever hold your peace! – I just realized and based from the informal chats I had with the locals, the best time to do agri-shopping here is around September and not early August. A City Like No Other– as we had our mid-night tour around the city, you would feel as if you were transported back in the Spanish era, with a lot of Spanish influences around the corner from the usual set up of pueblo (town) having the City Hall and other government offices near with the Church out of brick, schools within the vicinity ruins of history could still be felt in this city a must visit by any history geek! If I will be ask to go to this city again definitely I will! The 72 hour trip was not enough to explore and indulge this City! hasta luego Zamboanga! Take the road less traveled and see the beauty lies beyond the skyscrapers and urban life. It has been a month since we haven’t had any over the weekend adventure. Buddy and I were buzzin for some adrenaline kick which a hike, a dive, even a little spice over our weekend aside from sweeping the floor and painting our flat could give. 2 July, just the right start for mid-year assessment, in work, in our plans for the year and a kick off for our 2nd semester series of #outofthebox and #extremeadventure, we decided to hike Mt. Balagbag in Rizal. An almost 2 hours ride from Manila, and more or less 2 hours of hike to reach the summit and you’ll be able to see series of mountains challenging you to take the plunge and hike them out! On the North West was the Mt. Arayat in Pampanga (already hiked in 2014), Mt. Pamitinan and a lot more to discover! It was a usual hike for buddy and I, but we were surprised with what life has to offer- a group of students walked with and literally hiked with us as they did their case study for their documentary. It was a nice Saturday morning and in amazement, they’ve got surprised to know that buddy and I were no longer uni students, instead working for the public. From the usual hike to a search for possible subject of a university documentary we ended up listening to the interview and IR skills were in hype to asked for answers to taboo issues (e.g. child labor, human trafficking, UN SDG, prostitution and etc.) We gave them the not so usual advice-seek the reality world with questions for you to find the real answers. The adventure did not stop with the almost 2 hour hike, instead, we opt to take the adventure to a higher level, despite the gloomy weather and high chance of rain, we chose to do waterfalls chasing. The initial plan was to have it at Mt.Maranat which was a bit easier and way to descend, but we chose the hard way,together with buddy, 3 students, 2 individuals we’ve just met,and with our guide, we decided to go to Odiong Falls. As instructed, it was a four hours hike (RT) and see a crystal clear water before you. However, on the onset and in search of real adventure, we were descending in a jungle like ambiance as the heavy rain poured as if it has no plan to stop, we kept walking. We heard the usual first time hike jitters of leg pain , but continued to walk. Unfortunately, since the rain did not stop, the river turned into mud-like river. As if we were trapped in a secluded area (like the ones you see in Indiana Jones movie), the adrenaline just started to set in. Our guide has been a great help when we were about to go home (3pm). He assisted each and everyone of us to hike the steep and muddy part of the mountain since we were no longer able to cross the river. Some went dehydrated, others got hypoglycemic but we had to move. After a couple of hours, we reached the registration area (starting point) and just as any other hiking adventure we had, muddy, sweaty and dehydrated body welcomed the city. But such wont be a reason not to take the road less traveled – again. 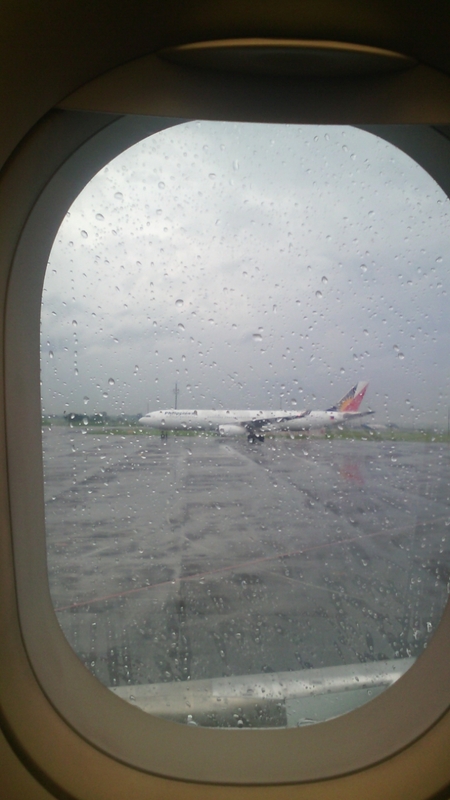 Perhaps it was a call to be on the road away from the demands of urban life and let ourselves soaked in the rain. Badian is located at South West portion of Cebu and 97.60 kms from Cebu City proper. Travel buddy and I were buzzin in for Canyoneering which is a popular activity in Badian. Canyoneering is an extreme sport which includes: trekking, swimming, jumping at several falls. PS: if you don’t know how to swim, no worries as your canyoneering guide will help you to conquer your fears both in water and in heights. Prior to our trip, I searched online for the backpacker price for doing canyoneering and its inclusions. We were not disappointed by what we’ve got. Through highland adventures (insetlrt link), we’ve got the best price for the activity. How did we get to Badian from Oslob? From whale shark encounter and chasing waterfalls #2, you have two (2) options: a. via bus going to bato, then take another bus ride going cebu via barili and tell the driver tl drop you off at Brgy. Matutinao or b. take habal-habal / motorcycle going straight to Badian. In the interest of time, travel buddy and I took option b. We left Oslob by 10isham, just in time to reach Badian by 12ish and up for canyoneering by 1pm. PS: the local government has 2pm cut-off, beyond that time will no longer be accepted to do the activity. There are a number of groups who do canyoneering guide as their means of living, luckily, ours is one of the pioneers who did canyoneering as a lifestyle and part of their daily lives back then. The entire activity took us around 4 hours (more), due to my cause of delay tactics! I’m pretty sure once you’re there you’re feet and knees would turn into jellies! But surely, after the activity, you’ll feel like katniss who won the hunger games! Situated in South Eastern part of Cebu, approximately 68 km from Cebu City. Approximately, one and a half to two hours travel time from the Cebu South Bus Station. What to do in Argao? If you’re an adventure junky just like me, there’s plenty of activities waiting for you. You can choose from spelunking to chasing waterfalls or just simply roaming around the Municipality and see the beautiful old structure that’s being well preserve by the people of Argao. If you’re up for adventures (e.g. cave diving, and water falls chasing and some food trip), the Municipality of Argao has something to offer for your adrenaline rush cravings. How to Get to Local Tourism Office of Argao? If you opt to take the latter, from the bus stop, cross the national road, straight ahead, turn right at the first corner then turn left and straight ahead you will see the Cabecera de Argao sign warmly welcomes you to the Municipality of Argao. It is best and highly advisable to contact the Local Tourism Office of Argao if you want to try spelunking and exploring Balay sa Agta. The reason is always due to safety precautions and the travel time from the Tourism office to the starting point is quite far. – Situated in Barangay Conalum and is believed to be the dwelling of Argao’s mythical giant, Mangao. Large quantities of guano or bat droppings are found in this cave. Also, one of the largest caves in Cebu. It is a standard Procedure to have 2 guides one in the front and one at the back, it was risky to assist a team of 2 or more individuals upon approaching the starting point of the cave. The entire spelunking took us around 3 hours, (1.5 hours) each way, with fruit bats, various rock formation welcomes you and as if waving their best spot for your camera to capture. As part of the package set by the local tourism office, my travel buddy and I took our liberty to capture the beauty of the falls. After a creepy encounter with the giant, you will be amazed by the eye candid view of Bugasok Falls from the top. As one of our guides find us (me and my travel buddy) a bit adventurous, our guide opt to take us to a nice view spot of the Bugasok Falls. Before, some professional mountaineers used to rappel from the top and have a nice dip on the falls. unfortunately, when we visited the place, it was no longer allowed. I am not sure for the reason. Argao is known for its delicacies such as torta and tablea/cocoa. Torta is their version of “mamon” made out of flour, tuba (coconut wine), margarine, yard, sugar on top and milk. We tried Jessie’s homemade torta over a cup of hot cocoa/tablea. The torta has its soft, yet a bit dry in texture (perhaps due to the wine) and the sweetness hot cocoa (due to its freshly harvest/freshly brewed) compliments the torta which made it irresistible and you would ask for more. Are you familiar with the Medieval Structures and castles back then in your history class? How about pictures of cavaliers and other Medieval aged personalities settled in one place? That is how Riverstone Castle was made of. It is actually an inn for those tourist who want to indulged themselves in different time and ambiance. The cost per night is 1,000 pesos without breakfast though. -Every backpacker has their adrenaline for old churches (which Cebu has a lot to offer). A rococo-baroque church built in 1734 but finished in 1788. *You can have your Lunch at Carmen’s Eatery the food is nice and it’s budget friendly, it’s a walking distance from the Bus stop so no need to ride a tricycle; There’s plenty of Carinderia along the Highway so you don’t have to worry about starving. ** If you don’t have reservations you have to wait for at least an hour for your tourguides who’s coming from Conalum. So it’s better to have your reservations ahead of time to avoid waiting. A 48 hour trip to detoxify and be offline for a day or two while satisfying adrenaline rush and crave for out of the box. Level of difficulty: Some bloggers/mountaineering enthusiast rate this with 2/9. From Bauan town proper take jeepney ride going to Mabini town proper (20each). From Mabini town proper take tricycle ride going to Philpan dive resort at Anilao which will cost you 40 per person. You will be required to sign up for registration which is 35 each and do sign off once you’re done hiking. Option 2: Take bus ride from Cubao or Buendia bus terminal going to Batangas grand terminal or Batangas port. From Batangas grand terminal there are jeepney rides going to Mabini. Either you rent the jeepney and pay 100/90 each depending on haggling skills.:). The jeepney will pass through Bauan, and Mabini town proper. If you opt to rent the jeep, the driver will take you to Philpan, Anilao Batangas for the jump off. 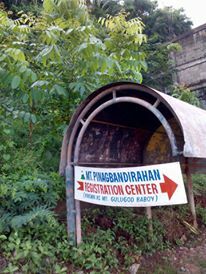 Register at the Barangay hall which would cost around 35 each and you’re off to go! There are no stations by the way, unlike the usual hike where you will be able to see trail marks and stations, in Gulugod Baboy there are no signs, no trail marks, just a plain and simple train uphill. It was a night hike, with 5 of us (ladies) who tried and exceeded our personal limits and defeat the stereotype of being fragile, and vulnerable. Since there were only two of us who were used in climbing, the rest of the three were newbies, it was indeed a good start. It was indeed a remarkable hike for one of our friends who got tired at the start of the trek. She’s not use with long walks and even have a heavy bag with her. Pack light as the norm for backpacking and hiking was validated. While suffering from cramps, and difficulty in breathing, we kept ourselves calm as there’s no room for back-off and not having mental alertness. Luckily, while on our way to the top, a family of 5 were at our back waiting for their turn to be on their way to home. Unknowingly, Kuya Randy (our guide), became helpful in a thousand reasons. He was able to carry our friend’s bag and her 4ltrs of water and accompanied her as she walked bit slower. He also managed to gave us a nice spot on top where we set-up our tent and be prepared for the next day. October 11, around 1am, we were suddenly woke up by soft rains yet, a bit strong winds hit o ur tents. There was also hustling sound that made one of our friend more scared than ever she’d been. Certainly, It was a scary early morning as we don’t know when will the rain stop and if our tent is suffice to beat the strong wind. Personally, I was thinking of how the team would descend in a sticky and muddy trail? 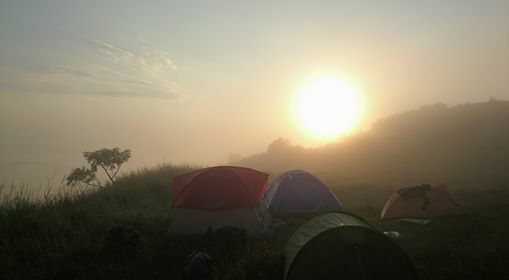 The rain last for 30 minutes and we go back to sleep only to find out that it was already early in the morning as the sunrise saying hi to us. 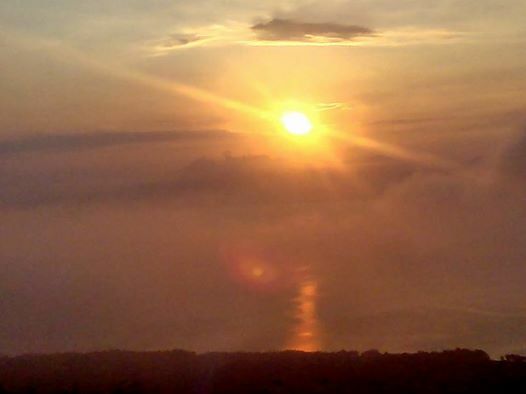 We have seen the sunset the day before while we were on hike the mountain, as we woke up, we were greeted by the fog as zero visibility waves his hand saying hello! The feeling was surreal, as we climbed and reached the peak (note: the camp site is not that far from the peak), the feeling of a winner sets in. Winner in terms of conquering your personal inferiority, stress at work or home, feel independent and responsible for your own well being ( as no one will care if you got caught in the middle of the night with a dog bite- of course that is a bit exaggeration), a dose of positivism lingers till you no longer know the word pessimism and negative vies. We left the camp site around 7am and started our way to the trail again. 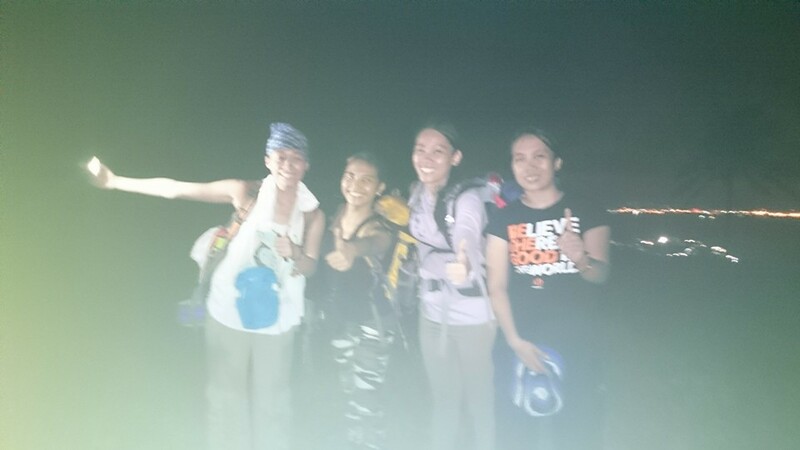 We met Kuya Randy again as he guide and assisted us on our way descending. As expected, it was a sticky, muddy and full of challenging trail awaited us. One of our friends got her shoes broken due to the mud, in result, she walked the trail barefooted. The descend took us 2 hours, as it was not that high mountain. We reached the jump-off by 9am. One of the perks of doing hike is to explore more of the place and even the community. 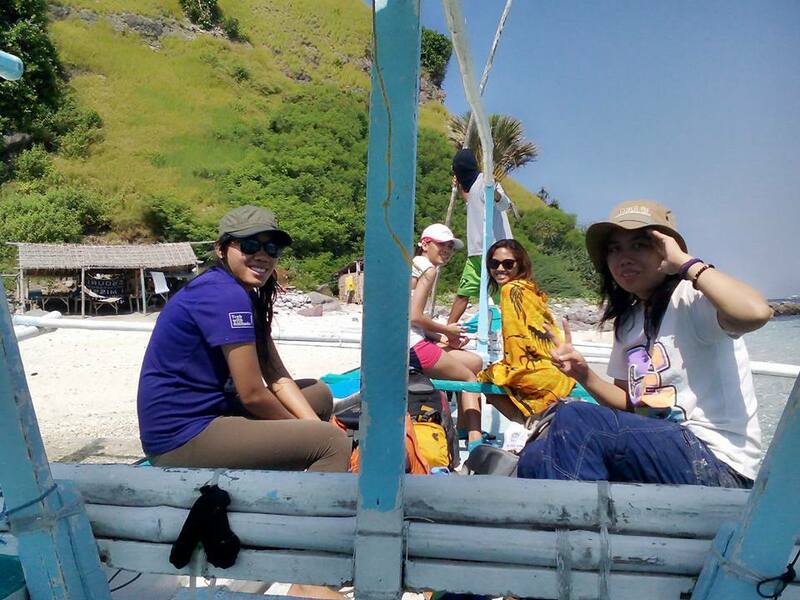 It was a nice community by the way, as we planned to booked a nice boat ride to one of the islands in the nearby area. A trip to sumbrero island cost us a fortune, instead, we opt to take the not so popular island- Oscar’s Island. The cost was around 500 each (for group of 5) as we rented a boat and traveled for 45 minutes. We did a quick stop at Sumbrero Island before heading to a much crystal clear beach. 2015 is an exciting, enticing, candid, challenging and the year of out of the box. Reasons varies like the colors of the rainbow. – Revolution to change the status quo and no longer settle for mediocrity and complacency. Months ago, I became part of an organization which lifts the Competitiveness of the country which translates in raising the bar for performance excellence not only in personal level but also state level. most of the time, random thinker as they say, but with a number of diverse people I met, I believe I could spend more time to listen as much as time allotted to speak. – Privileged. Is a word that could sum up what I am doing. As part of my duties and responsibilities as an employee I have to roam around the country and promote several advocacies towards competitiveness. A drum beating activity may sometime drain not only physical but also mental aspects of your being. Strike a balance between work-life and your off to go! – Since I volunteered last year, the chain of positivism lingers in me. Sounds cliche, but it is true. I could spend my long weekend volunteering for a cause than sit idle looking at the window waiting for my dreams and endeavors to become a reality. – I am pro financial literacy since then, I am quite lucky enough to be part of a small community which highly value education. Knowledge is power as they say. Last year I set up my own set of goals towards my financial status. I could tell that it is so strange that there are people who are attached to a thin colored paper which has really an imaginative value. Where did the value of interest rates, stock market valuations and a lot more came from? -As your age (practically the numbers associated with your existence), your values and even perspectives differs and widens. It is so weird to think that you have limited limitless time here. Limited coz at a certain time you will die, limitless in a sense that you can do a lot of things while existing. For an individual, it is an ordinary day,month or year, but for others it is already an extraordinary gift; of being alive and breathing oxygen and still rationally thinking. How about those who could no longer remember what they did?? so strange isn’t?